The Masterbuilt 20060416 Charcoal Bullet Smoker is a true wonder. How can anything this tiny pack such a smoky punch? This smoker was made for the grilling/smoking rookie, someone looking to get their feet wet in this world without a ton of cash to spend. Sturdy and lightweight, Masterbuilt has fabricated the perfect apparatus to gradually ease you into this wonderful culture of smoked food. I would say this charcoal smoker is ideal for those who like to camp out, go to tailgate events & parties or wants to transport their smoker without much hassle. Many reviewers like this particular Masterbuilt Smoker for that very reason. One lady commented a while back saying she took hers to the local lake where her and the family would smoke fruit and ribs while they fished and played in the water. Hey, what better than to spend a day at the lake while smoking your favorite grub! Check out the reviews and features, you won’t regret it! 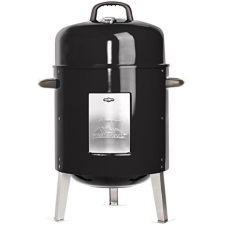 When you see the price of the Masterbuilt Charcoal Bullet Smoker online you’ll think every site is missing a decimal point. How could something this sturdy, compact, and with positive reviews cost in the $50 to $60 range? It is a bit confounding, but don’t fight it. If that’s what Masterbuilt is charging, who are we to argue! With that said, this is not a smoker for someone with smoker experience. This is a casual, beginner’s unit, take note. One would not expect a smoker for this price to be overly complex, but the relative simplicity is remarkable. You can get this unit up and running in no time and the instructions and tips that Masterbuilt includes in the packaging is wonderful. By far one of the best qualities that emerged from reviews online was the smoker’s simplicity to use. A great characteristic for nearly all of us – who wants to add difficulty to anything? The one thing I want to point out is that with a charcoal smoker you definitely get that nice authentic smoked flavor throughout your meat and you can get a more robust wood flavor by burning flavored charcoal and wood chips together. The downside is you have to attend a charcoal smoker; start it, stoke the briquettes, watch them this dispose of the charcoal, same as owning a charcoal grill. Tending coals however is part of the process! To each his/her own we suppose. If cleaning up wasn’t such a chore, I’d be a total die-hard charcoal smoker/grill fan! Masterbuilt delivers once again with this smoker, proving that even small packages can pack a big punch. Like camping, fishing, or tailgating? … then this one is for you. If you’re a novice or just need something simple, sturdy, and that will do the trick, this is the smoker for you. Plus, you’ll have some money left over to buy a heck of a lot of yummy meat!